Letters to Babylon follows a character named Chris during an in-patient stay at a residential treatment facility. Chris is admitted to the facility at the beginning of the game under unexplained circumstances. The semi-autobiographical narrative follows Chris during the five-week stay in the facility, with the player having a significant influence on the events of the game as well as on the nuance of what is really going on. The player exercises this mainly by either responding to or discarding letters from Chris' father and Chris' boyfriend, Ian. The narrative of the game changes dynamically based on the player's choice regarding these and other decisions. 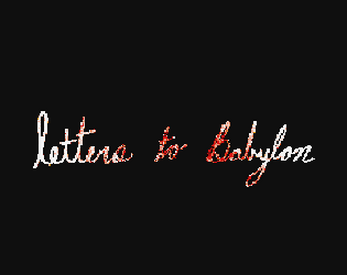 Note: Letters to Babylon addresses and confronts serious subject matter, including abuse, depression, self-harm, and drug use, as well as how relationships influence and are influenced by these experiences. These subjects were approached thoughtfully and from a place of understanding. Check out Neutrino Effect's Bandcamp to download a HQ version of the soundtrack EP.